English major Tiffany Barragan, vice president of Alpha Rho Sigma, is headed to law school. Full Name: Tiffany Duanjan Barragan. High School: "I went to two different high schools. For my freshman and sophomore years, I attended Liberty High School in Las Vegas where I was a cadet airman basic in Air Force JROTC. For my junior and senior years, I attended and graduated from Hutchings Career Center in Macon where I was a part of the live student newscast and the National Beta Club." Family: "I have three older brothers - Tom, Jonathan, and Adrian, and a little sister named Briana Mara. My pop’s name is Bulmaro and my mom’s name is Orasy. Anthony is my longtime boyfriend. I also have four dogs - Clyde (he’s a blue heeler), Benji (I let him sleep in my room sometimes), Heizen (which means heat in Spanish), and Luna (she’s part coyote)." Employment: Full-time student; part-time waitress/assistant hospitality manager at Tzango Cocina del Mundo on Hartley Bridge Road. Primary Campus: Macon. "I love this campus!" Activities: "I am vice president of Alpha Rho Sigma, the MGA Chapter of Sigma Tau Delta, the International English Honor Society. I am also treasurer of the English Studies Organization, and I am an official tutor at the Macon Campus’s Writing Center." Career Goals: "I plan to become an attorney, and I will eventually open my own law firm. I want to specialize in entertainment law, so I can work in Atlanta and help musicians by translating huge blocks of super convoluted contract information into plain English. I also want to specialize in international business transactions. I may even pursue specialization in extradition laws." She chose Middle Georgia State University because … "It was the sensible thing to do. I live at home to save money and the tuition is not expensive, so I will graduate debt-free. The quality of the education is incredible, and I love everything about the campus and the environment." The greatest thing she discovered about Middle Georgia State was … "The diversity. I have met so many interesting students, and literally, everyone is so supportive. The faculty and staff from the English department is amazing, and they really want students to do well. The professors will work with each and every student to make sure they understand the material. They will work beyond their office hours to help any student willing to make the effort to visit them. Also, the classroom environment is incredibly welcoming and entertaining. What makes it entertaining is the students here all have valuable and interesting information to share, especially in the literature classes. By the end of the semester, all of my classmates, including my professors, feel like family. That’s just what you get here at MGA." 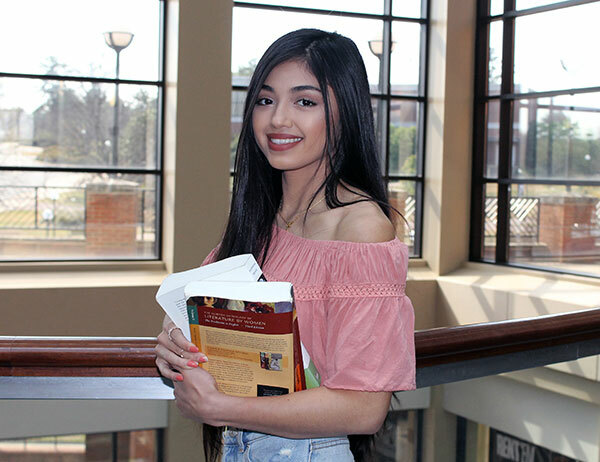 Her greatest academic experience as a Middle Georgia State student has been … "Seeing how much I have grown since I started as a freshman. I used to be intimidated by writing 500-1000-word essays and reading a 20-page assignment, but since I took a Shakespeare class, I realized how much I took my entry-level assignments for granted. I really worked hard in Shakespeare, and I learned how to take my readings slow because I had a terrible habit of speed reading and missing important information. Eventually, though, I was able to create this beautiful paper that I presented at the Georgia Collegiate Honors Conference and placed second in the 'Best Humanities Research Presentation' competition." To her, “greatness” means … "Moving forward each day, which could mean waking up five minutes earlier than you did yesterday or pouring your entire passion and energy into an assignment and turning it in early. “Greatness” also means being able to bounce back after taking a loss." One thing people don’t know about her is … "I love to cook and bake for others. I grew up watching my parents cook mostly Thai and Mexican foods, so I have always tried to mirror their cooking styles to create my own flavors." In five years … "I see myself getting established in my law career, continuing to become a more well-rounded and wiser individual."